GEO Cemetery is a digital mapping software, designed to help organisations to efficiently manage cemetery information including burial plots and leasing services. Our cemetery management system covers all aspects of burial and cremation administration which can be upgraded as and when legislation and technology change. Our GEO Cemetery products are cost effective and easy to use and helps the council members with their day to day management of single or multiple cemeteries. This is ideal for Councils and Community Groups, who want to preserve and manage the valuable information held by their burial ground securely and efficiently as it centralises, display and manage cemetery data. Users and organisations will also benefit from the GEO Cemetery system, as it efficiently manage operations, produces reports, invoices, tracks progress and ultimately generates revenue for the cemetery as well as offers an enhanced service to the bereaved. Our GEO Cemetery management system offers comprehensive features allowing to search, insert, display, locate and manage key cemetery information. It is very easy for the council members to set up their specific cemetery information, which will then be used by the system as a reference when using the GEO Cemetery Management. The parameters that can be customised include information on users, rates & fees, cemetery maps, invoices, reminders and communication letters. The importation of the grave spaces including their location (geo localisation). 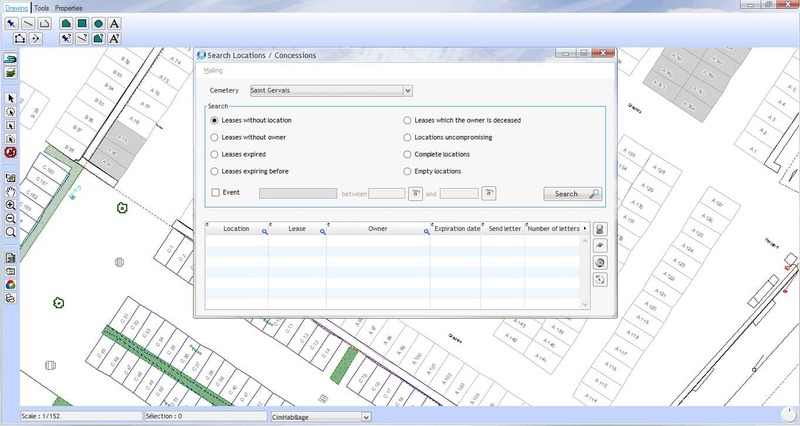 Once the required grave space has been identified thanks to the advanced search system of the cemetery management GIS tool, a function enables the user to automatically pinpoint it on the cemetery plan. It is then displayed with the grave space number. Alternatively, by clicking on a specific grave space, immediate access to the grave data sheet is provided allowing comprehensive visualisation of the corresponding data. GEO Cemetery management system allows easy update of the information including locations, burial plot rights, individuals, administrative events, technical events and prices list using the data entry use friendly interface. It also allows comprehensive management of the lease services including access to prices, generating invoices, renewal reminders and communication letters. Additional features in the application allow to import pictures, send emails, print maps and letters, official documents or certificates to assist the council members in their day to day tasks. 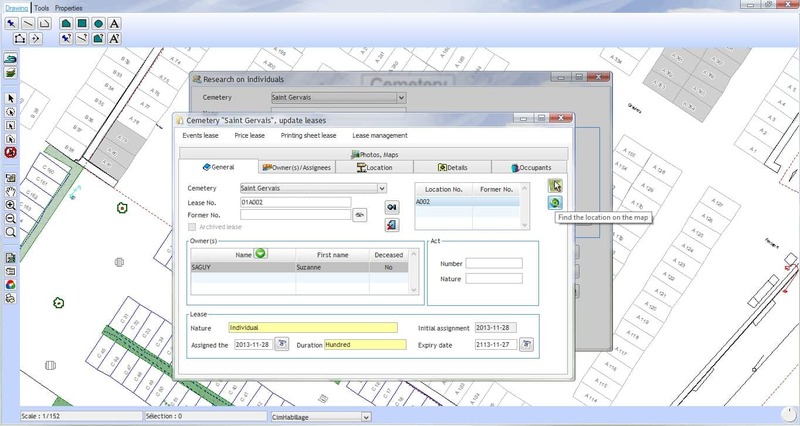 Need to manage your cemetery data on a mapping software?